Our product is environmentally safe as we only used pure cotton,besides ,it has a design that can make your home more beautiful. It can hold up nicely even without items inside. It can carry a full load of laundry. You'll like the fact that you can move it easily on your laundry days. DURABLE and STURDY CONSTRUCTION: Made of 100% cotton with metal wire around the rim to hold it's shape and structure. LIGHTWEIGHT AND PORTABLE: This laundry hamper Has two black handles on both sides and collapses when not in use. MULTI-PURPOSE. 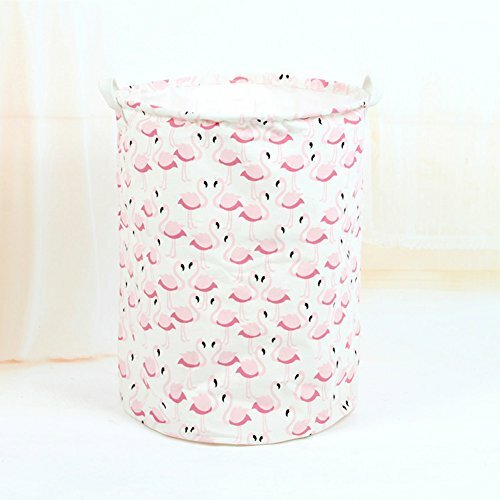 Laundry Basket store everyday household items such as blankets, pillows, bedsheets, towels etc. Use it as a laundry hamper for college students in dorm too. BEAUTIFUL AND UNIQUE:Hamper Storage can be a excellent decoration in our home. View More In Laundry Baskets.